3/1 - Town of Esopus, Ulster County: The visual caretaker and monitor of bald eagle nest NY261, Dave Lindemann, reported that the mated pair were incubating eggs. 3/1 - Town of Wappinger, HRM 67: The air temperature fell to 0 degrees Fahrenheit overnight, tying the record low for the date. In Newcomb, 235 miles north in the watershed, the overnight temperature fell to 20 degrees below zero. 3/1 - Croton Point, HRM 34: I counted 23 bald eagles this morning - a mix of adults and immatures - the majority of them near the camping area. A couple of wary buffleheads were swimming beneath the eagles in Croton Bay. 3/1 - Manhattan, New York City: I spotted a red-necked grebe (in transitional plumage) feeding not too far off the shore along the east side of the East River a short distance south of the Robert F. Kennedy Triboro Bridge. Among other duck species present were ruddy, common goldeneye, bufflehead, gadwall, black duck, and red-breasted merganser. 3/2 - Cohoes, HRM 157: The Barrow's goldeneye, spotted yesterday by Scott Stoner, Gregg Recer, and Naomi Lloyd, was still present this morning on the Mohawk River at Cohoes. 3/2 - New Baltimore, HRM 132: I sat and watched for more than half an hour as a lone coyote attempted to cross the river. He came across from Schodack Island, very cautiously eying the shipping channel with its loose floes, before finally giving up and heading back to the island. 3/2 - Town of Poughkeepsie: This was Day 5 of the nest watch for NY62. The adult eagles switched incubating roles at 11:30 a.m. and 4:00 p.m. When the male was relieved, he dropped down to a sheltered area of the field with little snow, gathered some grass, and brought it back to the nest. 3/2 - Stony Point-Verplanck, HRM 40.5: I’ve been spending the last few days along the river watching the ice floes thin out during the last two hours of the ebb tide. Despite the cold air temperatures, the increased daylight and strength of the sun were taking their toll. Thanks to the eagles we know there are plenty of gizzard shad in the river. They come off their Rockland County night roost in early morning and perch along the shoreline from Tomkins Cove to Bowline Point (HRM 41-37). From there they head out onto the river ice to find their fish. 3/3 - Town of Poughkeepsie: This was Day 6 of the nest watch for NY62 and there was another midday changing of the guard. Dad brought in more grass as they switched roles. 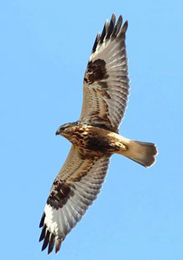 Mom was really generous today: when she left the nest, she flew straight toward us, right over our heads! We don't always get that lucky. 3/3 - Town of Wappinger, HRM 67: The air temperature fell to 2 degrees F overnight. In Newcomb, 235 miles north in the watershed, the overnight temperature fell to 19 degrees below zero. 3/4 - Warren County, HRM 206: I stopped for a while at the Fenimore Bridge between Hudson Falls and South Glens Falls and saw about 300 common goldeneyes, three buffleheads, a single black duck, and – the highlight – a drake redhead duck. 3/4 - Saratoga County, HRM 183: I spotted two pairs of redhead ducks on the east side of Stafford's Bridge, mixed in with 150 mallards and black ducks. 3/4 - Gallatin, Columbia County, HRM 100: We have bird feeders set up around the driveway and have had many visitors: redpolls, chickadees, juncos, titmice, nuthatches and woodpeckers. As the light waned on this relatively warm afternoon, I saw the first chipmunk of the season emerge from his tunnel. He sat there seemingly stunned by two feet of wet snow and the activity of squirrels and bird traffic all around. The chipmunk ventured a short distance from the hole over the snow, then scurried back, presumably so as not to lose track of his refuge. 3/4 - New Hamburg, HRM 67.5: While clearing up after last night’s storm, we spotted nine bald eagles that had taken up temporary residence on a large ice floe just offshore. We only saw one white head and believed the rest were immatures. Fifteen minutes later they were gone with the tide. We saw no evidence they were fishing. 3/4 - Town of Wappinger, HRM 67: The last snowstorm of the winter? Seven more inches overnight added to our “piecemeal blizzard” making the winter total 66 inches. In the aftermath, I went looking for tracks in the fresh snow. Three or four coyotes must have had a party in my front yard, oblivious to the deep snow. The two white-tailed deer herd paths on the opposite side of the yard – where 30 inches of snow had been tamped down to less than a foot – looked unused, which I found strange. Then I found them. At least ten white-tails had used the less-difficult road for travel. Charlotte Demers (SUNY-ESF) reminded us that depth of snow is far more disruptive to deer than below freezing winter nights. 3/5 - Newcomb, HRM 302: Overnight air temperatures dropped to 21 degrees F below zero. In New York City, more than 300 miles south in the watershed, the low temperature was a “balmy” 19 degrees. 3/5 - Saratoga County, HRM 183: The “redhead gang” on the east side of Stafford's Bridge had increased since yesterday to three pairs that were swimming and diving with a pair of lesser scaup. 3/5 - Gallatin, Columbia County, HRM 100: This morning, amid the cooperative feeding of squirrels and six crows along with numerous songbirds, there suddenly appeared two chipmunks bursting over the frozen crusted snow, this time locked belly-to-belly, rolling, sliding like a bocce ball at top speed from one spruce tree to the next, then breaking apart to careen in opposite directions. Spring must certainly be at hand. 3/5 - Green Island, HRM 152: On Thursday, birders met at this week's hot spot, the open water below the federal dam at Green Island. We saw a few dozen common goldeneye, one long-tailed duck, and the two red-necked grebes. 3/5 - Cohoes, HRM 157: Later, our Thursday birders traveled to Cohoes and, with careful scoping, eventually pulled out a male Barrow's goldeneye [see 3/2]. He was really a textbook specimen, showing every field mark to perfection. A flyover merlin sent the resident pigeons into the air. 3/6 - Saratoga County, HRM 183: There were still six redhead ducks at Stafford’s Bridge early this morning and they were all paired off. 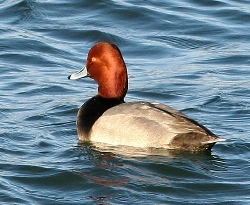 In mid-afternoon they were joined by a drake bufflehead, though the redheads had been reduced to four: three drakes and one hen. 3/6 - Altamont, HRM 144: While driving along the open fields of Indian Ladder Farm orchard, I noticed a medium-sized dark spot moving on the snow. Initially thinking it was a northern harrier, I went back to get a better look. I was surprised to see an early season woodchuck stretching its legs after a winter's snooze. It looked so out of place in a snow-covered field. The longer length of days had not translated into a warm day, given a morning low of zero; it was only in the teens when I saw the woodchuck. Note: Even with the bright sun and snowy white background, no shadow accompanied this groundhog. Spring is close. 3/6 - New Paltz, HRM 78: The air temperature was 1.7 degrees F below zero this morning above the flood plain of the Wallkill River. Although the cardinals had been singing for several weeks, this morning we saw a male cardinal pick up a seed from the bird feeder and give it to his lady-love. It may be cold, but the longer days are bringing changes, and not just to eagles. 3/6 - Town of Poughkeepsie: We arrived on site (eagle nest NY62) at 10:30 to find the female incubating and the male perched in a tree near the nest. There may have been a recent turnover as he left and did not return until 2:50 p.m. when he relieved mom. The next nest exchange occurred at 4:30. It is interesting to note how they regularly time their change-overs with a minimum of audible communication; it is very likely that their non-verbal exchanges are entirely adequate. 3/6 - Town of Wappinger, HRM 67: The air temperature overnight fell to -2 degrees F, tying the record low for the date. In Newcomb, 235 miles north in the watershed, the overnight temperature fell to 29 degrees below zero. 3/7 - Cohoes, HRM 157: The Barrow's goldeneye was still present in the Mohawk River below Cohoes Falls, viewable now with a group of common goldeneyes. 3/7 - Cohoes, HRM 157: What a beautiful day for birding! We were easily able to add Barrow's goldeneye to our life-lists this morning at the Cohoes Falls overlook. 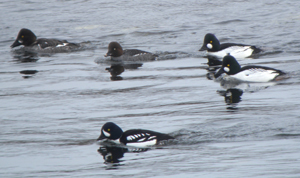 The Barrow's goldeneye cooperated by swimming fairly close in the company of many common goldeneyes. We also had an adult bald eagle flyover and an immature on the ice above the falls. 3/7 - Staatsburg, HRM 85.5: As we walked up the hill to the cabins at the Mills-Norrie Campground, we were discussing the local eagles. With the river still frozen over solidly, would they delay nesting until there was open water? But at the top of the hill we looked across the river and, though we couldn't see a white head on the nest, we did see an adult bald eagle sitting in a tree very close to the nest. Then our attention was drawn to our side of the river by the loud cries of nearby crows. Looking up, we were treated to two ravens soaring just above the treetops, noisily pursued by several crows. The ravens went south toward Norrie Point and the crows, satisfied with their work, settled in the campground's trees. 3/7 - New Hamburg, HRM 67.5: Winter appeared to be loosening its grip on the estuary; many open patches of water extended outward from Diamond Reef in mid-river. While we saw no eagles, we could infer that they had been here recently. We counted a half-dozen fish carcasses strewn over the ice in several places where eagles had their fill, and now the gulls and crows were cleaning up. 3/7 - Peekskill, HRM 44: Traveling south on Route 9 this morning presented a perfect opportunity to look up into the clear blue sky and see two adult bald eagles dancing around and having the time of their lives as we were trapped in our cars below heading somewhere. The sunlight was perfect to spotlight their brilliant white heads and tails - no mistaking those marks! My traveling companion was amazed, eyes glued on the two birds as long as possible. 3/7 - Croton-on-Hudson, HRM 35: An adult bald eagle passed over my deck numerous times this morning within 40 feet before disappearing into the trees down by the river just north of Croton Landing. It talons were full of twigs. Nesting materials? Wednesday, April 8: 10:00 a.m.
Furs and Totems: Connecting Young Minds To Nature at the Saratoga Springs Public Library [Saratoga County]. Join NYSDEC Hudson River Estuary Program Naturalist Tom Lake as we investigate relationships and apply our imaginations to better understand our natural world. Intended for elementary school age children. For information and to register, call 518-584-7860. Wednesday, April 8: 1:00 p.m. The River before Henry: How the ten millennia before European arrival shaped the world we see today. Saratoga Springs Public Library [Saratoga County]. Join NYSDEC Hudson River Estuary Program Naturalist Tom Lake as we journey through time from the last ice age through extinctions caused by climate change to our arrival in the Northeast. For information and to register, call 518-584-7860. To subscribe to the Almanac (or to unsubscribe), go to DEC's Email Lists page at http://www.dec.ny.gov/about/65855.html , enter your email address, and click on "Submit." A page listing available subscription topics will appear. Scroll down; under the heading "Natural Areas and Wildlife" is the section "Lakes and Rivers" with a listing for the Hudson River Almanac. Click on the check box to subscribe. While there, you may wish to subscribe to RiverNet, which covers projects, events and actions related to the Hudson and its watershed, or to other DEC newsletters and information feeds. Weekly issues are archived at http://www.dec.ny.gov/lands/25611.html . The DEC website's search engine can find species, locations, and other data in the archives. For real-time information on Hudson River tides, weather and water conditions from eight monitoring stations, visit the Hudson River Environmental Conditions Observing System website at . Information on the movements of the salt front in the Hudson estuary is presented by the U.S. Geological Survey: http://ny.water.usgs.gov/projects/dialer_plots/saltfront.html . DEC, in partnership with ParksByNature Network®, has launched the New York Fishing, Hunting & Wildlife App for iPhone and Android. This FREE, cutting-edge mobile app gives both novice and seasoned outdoorsmen and women essential information in the palm of their hands. Powered by Pocket Ranger® technology, this official app for DEC will provide up-to-date information on fishing, hunting and wildlife watching and serve as an interactive outdoor app using today's leading mobile devices. Using the app's advanced GPS features, users will be able identify and locate New York's many hunting, fishing and wildlife watching sites. They will also gain immediate access to species profiles, rules and regulations, and important permits and licensing details.